Concealed carry holster system background page. Carry your gun in a concealed holster. Long ago and far away in a place called Viet Nam. 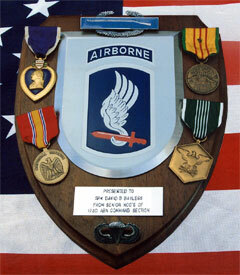 In 1967, I volunteered for the Draft, volunteered for the Paratroopers and Rangers and Special Forces and for Viet Nam. As I had volunteered for the Draft and would not enlist for a longer term, two years sounded like an eternity to someone 20 years old, after Paratrooper training was completed, I shipped out for Viet Nam, where I served with the 173 rd Airborne Brigade. I was Paratroop Infantry and walked into two ambushes on point, had a hand grenade blow up in my face, by the Grace of God only received minor wounds, and shot it out with a Viet Cong on rear security after we had blown off the top of a mountain with H.E., high explosive and napalm. I was in numerous firefights in Viet Nam, the longest lasted four hours, received the Purple Heart and the C.I.B., Combat Infantryman's Badge, along with other medals. I walked a lot of point, there is no more lonely feeling than having a company of over a 100 men all strung out behind you in the jungle, or a platoon of over 30 men, or a squad of 8 or 9 men, or a fire-team of 3 or 4 men---with nothing between you and Death but the end of your rifle barrel. I was trained to never let my rifle out of arm's reach, whether eating, sleeping, going to the bathroom, whatever, and I have carried a variety of handguns, both revolvers and automatics for concealed carry, almost 24/7 ever since Viet Nam for over 30 years now. I have tried a wide variety of holsters, and have a whole box full of them, shoulder holsters, belly band holsters, belt holsters, F.B.I. carry, inside the waistband or pants holsters, Thunderwear and Smartcarry holsters, Pager Pal holsters, fanny pack holsters, ankle holsters, etc. They all work well for concealed carry, some better than others, especially when sitting in a car with your seatbelt on while driving, or sitting in the bathroom with your pants down, or lying on your back or your stomach, or trying to defend the gun while holstered from someone trying to take it from you, however I think my holster design fills a unique niche. I have practiced hundreds of draws from each type of holster system or design for concealed carry and I have hardly ever had handguns hang up or snag on a holster, however I have had handguns hang up or snag with practically every holster system or design on clothing. This is not the fault of any holster or holster system or design or maker, it is the fault of the clothing, off the rack, department store clothing is not designed with the concealed carry of handguns in mind, it has pockets and seams and buttons and pleats and zippers and hems in the wrong places, is either too loose or too tight or is of the wrong material. I am developing a Patent Pending clothing line designed for concealed carry around the different holster types to remedy this problem, and I hope to have it for sale on this website in the near future. In all the times I had handguns snag on clothing I was never injured, why because I follow two rules of handgun safety and you should too, one is never ever practice your draw with a loaded gun, always check and make sure the gun is unloaded before you practice your draw and dry firing of your handgun. Two, never ever put your finger on the trigger of your handgun until the handgun has cleared the holster and is pointed safely away from your body at the target which you have identified. We refuse any liability for anyone who does not follow these two rules. I recommend that when you practice drawing your handgun from any concealed carry holster system, that you first check and make sure the handgun is unloaded, holster your handgun, pick a target in front of you at any realistic combat range, quickly draw your handgun, not putting your finger on the trigger until the handgun has cleared the holster and is pointed safely downrange away from your body at the target which you have identified, bring your handgun up to eye level, get a good sight picture and squeeze the trigger. Then with your eyes downrange on the target and the surrounding area, re-holster your handgun. Try this against one target or multiple targets at various ranges. This is the best and most realistic way to practice your draw from concealed carry and trigger squeeze, and can be done much more quickly than I can describe it. I also like to practice my draw and trigger squeeze while moving and while taking cover behind walls or furniture or appliances, which simulates cover and concealment. I also recommend going to a shooting range, I try to go at least once a week and fire 100 or more rounds of ammo. I go to the Iowa D.N.R. Charles "Butch" Olofson Shooting Range just north of Des Moines near Polk City. Michael Warman manages the range and the gun shop, and is an excellent gunsmith, and sells firearms at a reasonable price. Michael has handguns and rifles and shotguns for sale, and since it is a shooting range in most cases you can shoot them on the range to see if you like them before you buy. Also you meet a lot of people and make a lot of friends at the shooting range, and they will give you tips on shooting and concealed carry and in a lot of cases let you try out their handguns or shotguns or rifles. I have met some regular folks and some law enforcement and military personnel at the shooting range that gave me excellent information on concealed carry weapons, lights, lasers, ammunition, etc., and let me try out their gear. 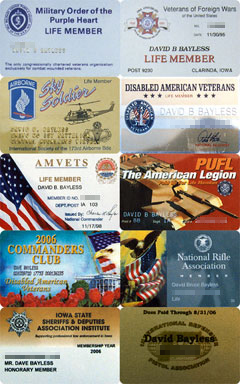 The range also has Concealed Carry classes to get your Permit to Carry, I.D.P.A. type shoots and Advanced Defensive Classes and N.R.A. classes.